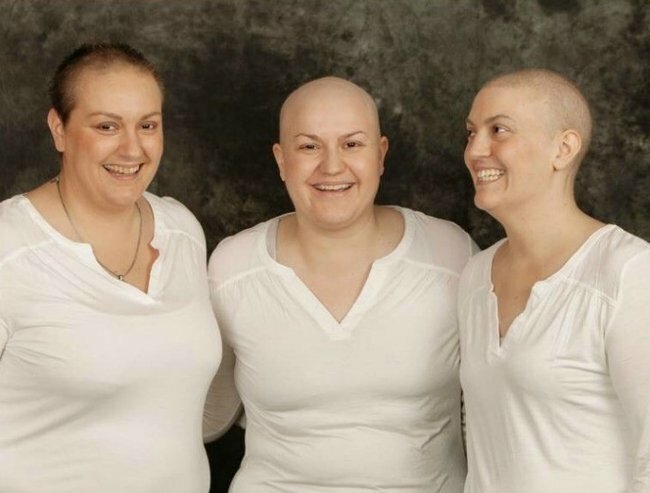 3 sisters were diagnosed with cancer just weeks apart. 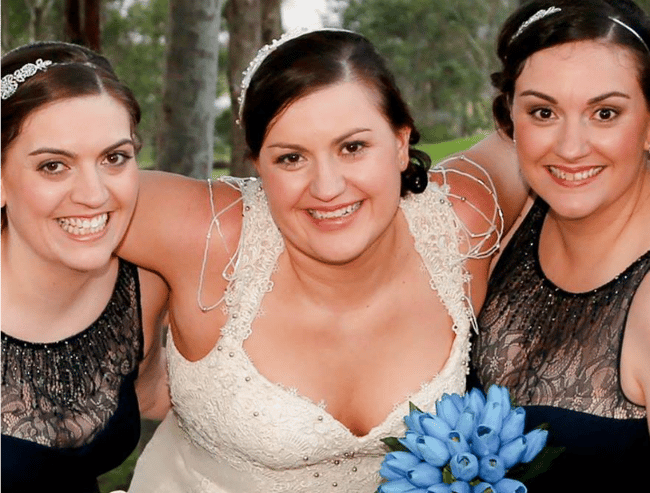 When Katie Warrant was diagnosed with bowel cancer at just 28 years of age, she and her entire family were completely stunned. Initially the doctors were so sure there would be another explanation for her symptoms, they didn’t even perform the routine test for bowel cancer when searching for a diagnosis. Katie had surgery, followed by six months of intense chemotherapy, only to be re-diagnosed after a tumour grew around her kidney. But that wasn’t the most shocking news for the close-knit family. The next day, her sister Kristal Ford-Spencer, 33, was diagnosed with breast cancer. Kristal told Mamamia she found a lump in her breast but didn’t think it was anything serious until she received a phone call after her mammogram asked her to go straight to her doctor for the results. “My doctor couldn’t look at me,” Kristal said. Just five weeks later, their middle sister, Cassie Ford, 31, was also diagnosed with breast cancer. She was prompted to check her breasts when a professor at the hospital where she worked heard about her family’s health battles and showed her how to perform a proper breast exam. “That night she tried it and straight away found a lump as soon as she put her hands on her left breast,” Kristal said. Cassie told Kristal that she too had the insidious disease and days later they told Katie, who was recovering from another gruelling surgery. “She just couldn’t believe it, as we all couldn’t believe it,” Kristal said. Katie’s DNA contains a genetic mutation called Lynch syndrome passed on from their mother, who was diagnosed with ovarian cancer when she was 31. Kristal said doctors were sure that her and Cassie’s breast cancer was related to genetics, but neither tested positive for the BRCA1 or BRCA2 mutation associated with breast cancer. 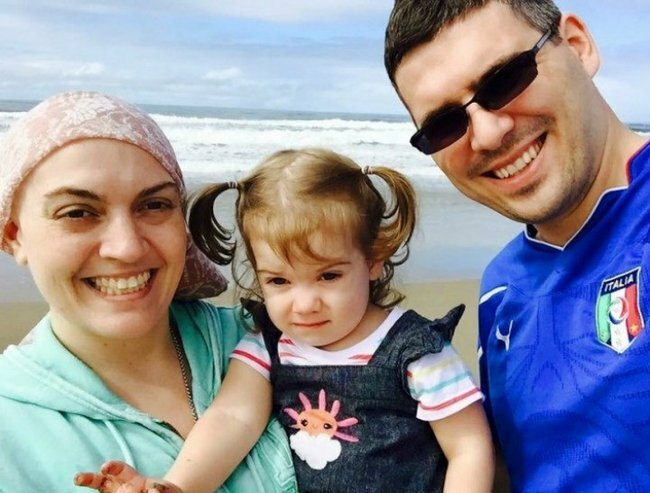 “They are sure there is another gene, but we are at a loss as to which one,” Kristal said. After each enduring taxing rounds of chemotherapy, Kristal and Cassie are on the road to recovery. But Katie, who has a young daughter, is still fighting her battle against bowel cancer. Katie with her husband, Dale, and daughter, Abby. Image via GoFundMe. Kristal said while the sisters were undergoing their own private battles, they were desperately trying to be there for each other. “None of us really took care of ourselves, we were always concentrating on the health of the other two,” she said. She said it was nice that the trio could relate to what each sister was going through, but it was also horrible to have to worry about them as well. “Katie said it perfectly to me one day when she was getting sick of people saying at least you are all going through it together,” Kristal said. “Will they both survive? How advanced is it? Will it spread? Kristal (left), Cassie (middle) and Katie (right). Image via Facebook. “It is nice having my sisters understand what I’m going through, but at the same time, it is horrible because you can’t just concentrate on your own health. Kristal said she hoped to encourage other women to regularly examine their bodies and to keep fighting for a diagnosis if they believe there is something wrong. “You have to learn to trust your body, know your body and understand when your body’s not well,” she said. 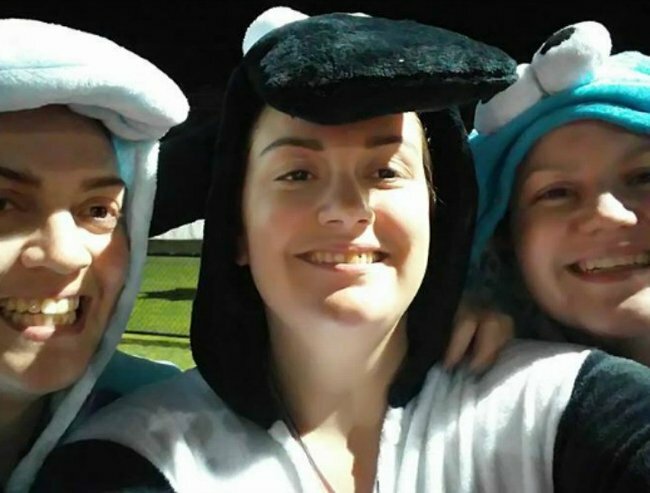 The sisters were recently gifted a round-the-world holiday by KISS FM and Cathay Pacific, which they plan to take after Katie’s surgeries have been scheduled. They are hoping to raise funds to include their husbands and kids on the family holiday. To donate, click here.